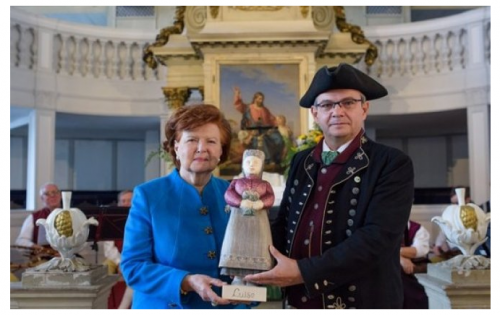 On October 17, President Vaira Vike-Freiberga – President of the World Leadership Alliance–Club de Madrid (WLA-CdM), Former President of Latvia – was awarded the “Luise 2018” at Friedenstein Castle, Germany. This is the most valuable prize in the field of national culture in Gotland, Germany. Due to the Latvia’s relation with Germany, the Former President of Latvia holds a great respect and honor to Germany’s traditions. In October 2018, President Vike-Freiberga was awarded the “Luise 2018”. The announcement ceremony had the attendance of Igna Skujina, the Lavitan Ambassador in Germany and Gotas, the Mayor of the City. Mayor Gotas was the one to grant her this Prize. One of many projects which President Vike-Freiberga is working on is the building of the Next Generation Democracy with Michael Dukakis Institute (MDI), a partner of WLA-CdM. They are together developing the AIWS 7-Layer Model in the upcoming age of AI.